A favorite since 1964. Read the Hands Down rules below. Overview: Hands Down is a classic dexterity game dating back to 1964. Still fun (and luckily in production), this game sets player against one another in a slap-silly race to gather the most pairs of cards. Hands Down Rules: Place the game unit in the center of the play area and sit in front of one of the colored hands. Choose a dealer. The dealer shuffles the deck and deals four cards, face down, to each player, placing the remaining cards in the center of the play area to form a draw pile. Players may look at their cards but should not reveal them to other players. Play begins to the left of the dealer. Players begin each turn by drawing the top card from the draw pile. After drawing, see if you have any matching cards, forming pairs (and only pairs, no three of a kind or more). Note, jokers are not wild. They are saved in your hand until the end of the game. 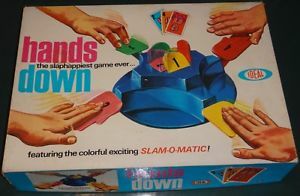 When you have a pair, slap your plastic hand, saying “Hands Down!” Each other player then slaps their plastic hand in response. The last player to slap their plastic hand loses the Hands Down. Once the loser has been determined, place your pair onto the table and draw a card at random from the loser’s hand. If you have another pair, repeat this process. You can play as many pairs as possible on your turn. Note: If the unit jams and does not reveal the loser of the hands down, the action does not count, and the player who initiated the “Hands Down” decides if they want to do so again. The Hands Down rules state that players with zero cards in their hands do not participate in a Hands Down. When your turn is over, say, “Pass.” You must pass if you do not have any pairs and you do not wish to fake a Hands Down. Play continues to the left. Faking A Hands Down: You may fake a Hands Down during your turn whether you have a pair to play or not. To fake a Hands Down you simply act as if you are going to slap your plastic hand without actually making contact with it. Any players who respond to your fake-out by slapping their plastic hands receive a penalty. Take one card at random from each of the offending players. Fouls: According to the Hands Down rules, there are several fouls. First, if on your turn you either fail to fully depress your plastic hand in a Hands Down, your turn ends. Second, if you touch your plastic hand on a fake Hands Down, your turn also ends. Finally, if any other player touches their plastic hand before you do when you initiate a Hands Down, you take one card from their hand at random. Additional Hands Down Rules: There are two additional rules to keep in mind when playing Hands Down. When the draw pile runs out, players begin each turn by drawing a card at random from an opponents hand of their choice. When you begin your turn with zero cards in your hand, draw two cards instead of one from the draw pile. If the draw pile has been depleted, draw two cards at random from a single player or one card at random from two different players. Winning the Game and Scoring: The game ends when all cards have been played except for the joker. Each pair is worth one point, and the joker is worth two points. The player with the most points wins the game. In the event of a tie, pairs are worth face-value (i.e. a pair of 5’s=5 points), and the joker is worth 20 points. The player with the highest score wins.